When I added ‘Customize a motorbike’ to my #40at40 list I was not thinking of any motorbike. I was of course thinking of my own. 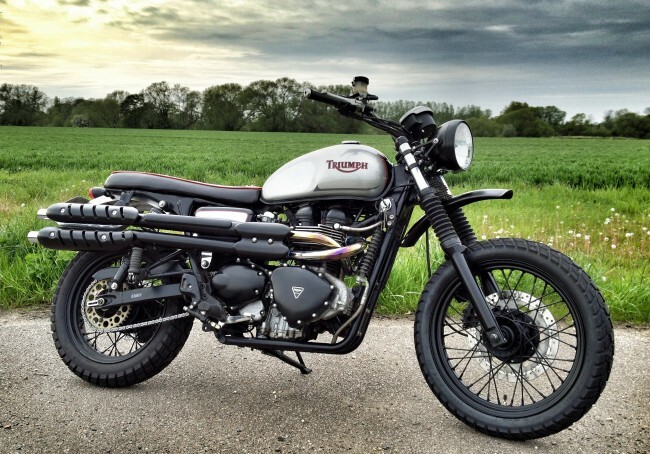 As I touched upon in a previous blog post, some people change their motorbike every year. 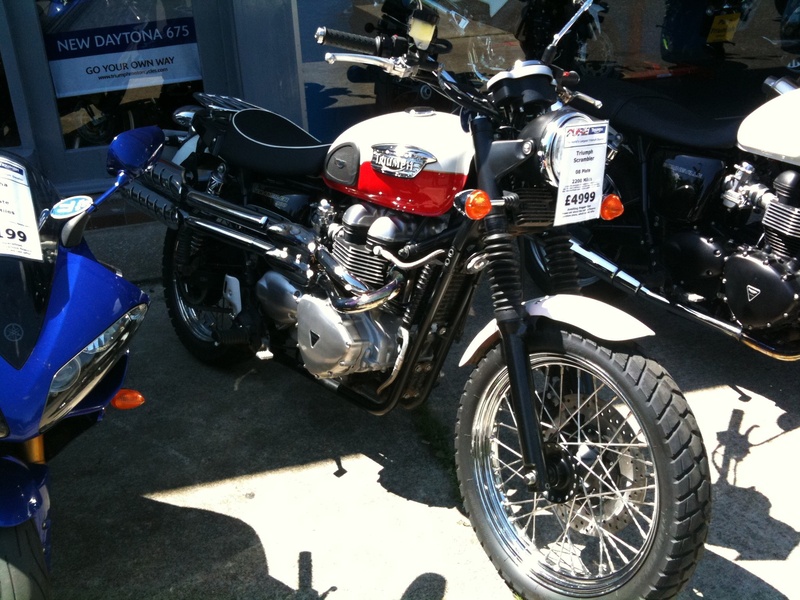 If a bike is well looked after, the trade-in price or money from a private sale can go a long way to securing the latest model. There are I’m sure a heap of reasons for people to ‘trade up’, The wrong choice in the first place, fitness levels, an evolution in riding style, but sometimes it can be just plain peer pressure as other riding buddies go shopping for the latest and greatest spec to roll out of the factory. Personally I’m not sure there are any great advancements year on year outside of styling and sometimes these can be as subtle as a colour change. 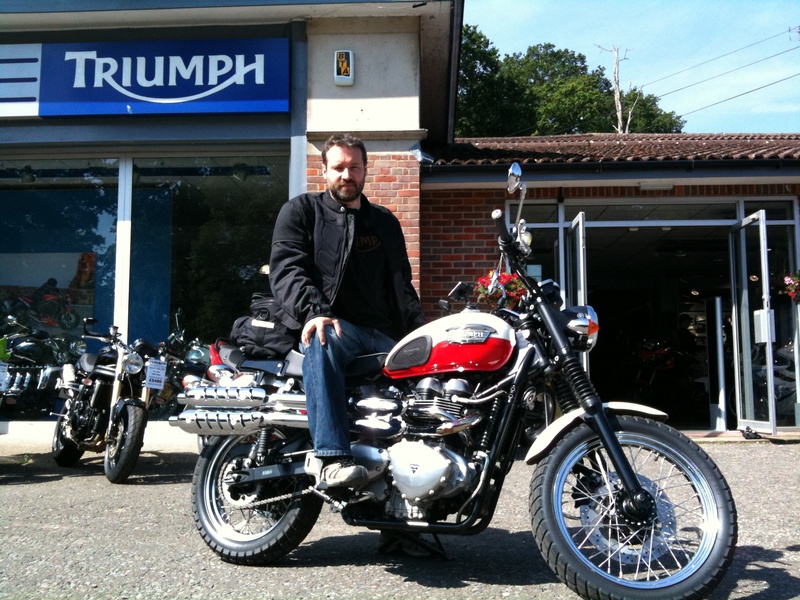 When I rolled up to a Woburn Triumph garage in 2010 I was sat on a BMW f650gs. A bike I felt over complicated for my needs. I had the cash in my pocket for a second hand Street Triple i’d seen advertised and while waiting to take it out for a test ride I was given the Scrambler 900 to try. I fell in love with it immediately. As I said in my previous blog.. It was everything I wanted in a bike. The ride, the sound, the simplicity. And it wasn’t tuned like a Speeder Bike. It’s a timeless bike as much fun at 30 as it is at 90 (allegedly). So why mess with it? To make it mine is the simple answer. To make it mine and something incomparable to other Triumphs. I looked at all the parts I could fix to the Scrambler. Simple things. Boltonable things. But they are off the shelf and if you hang around a Triumph dealer long enough you’ll be sure to see the guy who has bought them all. And bolted them on. And then everyone looks the same again. When I caught sight of one of the bikes Spirit of the Seventies had modified, it was like nothing I’d seen before. I didn’t have the cash to go for an all out frame and engine remodeling. But after a couple of long chats on the phone with the MD Tim Rogers, I knew they were the guys i’d like to leave my bike with. They asked me what I wanted and I created a pinterest mood board of a few things that had caught my eye. I too’d and fro’d uming and arring about what I wanted and Tim was super patient. 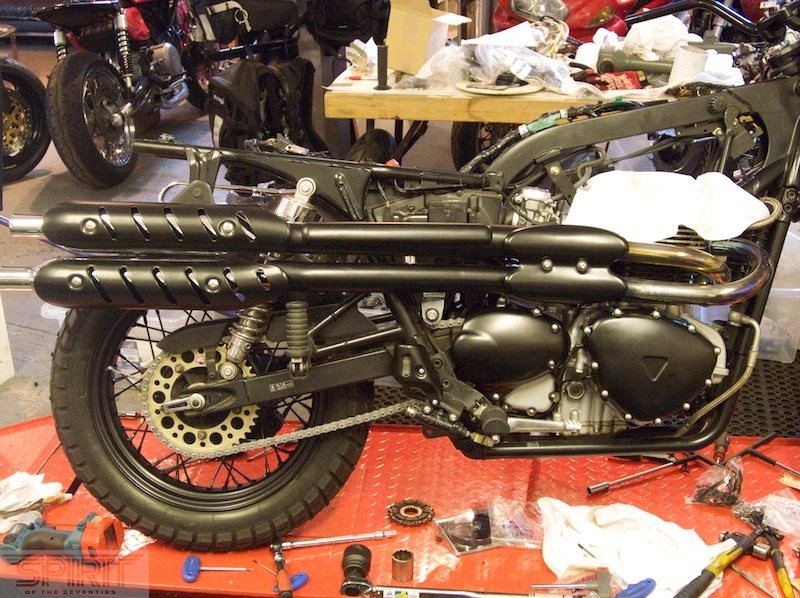 As well as the cosmetic tweaks, I had them do some work the bike needed to stay mechanically sound and pass it’s MOT. -Bespoke leather seat by Viking Vinyl with red stitching. Hide sourced by SOTS from Scotland. The bike was with the guys for a little over a month. 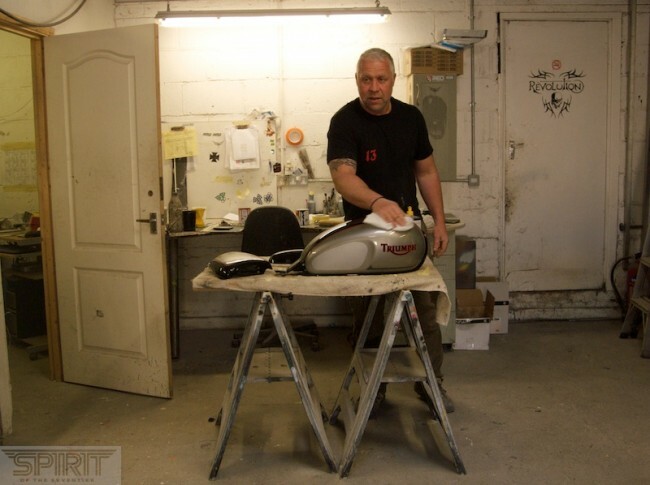 Their workshop and time is in massive demand at the moment and I was just glad they agreed to take it in. I did not expect the great level of continual communication and although it felt weird not having the bike around, I was in no rush I knew the bike was in good hands. It was a wet and windy day when I went down to pick up the bike. It was a wet and windy ride all the way home. I didn’t mind. I was on my ‘new’ bike. Thanks to the guys at Spirit of the Seventies for their great service, hard work and fair price. If you are looking for something similar or just want to ask them a question, they are on twitter as @SpiritOfThe70s or are easy to contact through their blog. Making a bike your own is part of growing up.